juanbook: Oldbike: Why won’t you start?!? Oldbike: Why won’t you start?!? The first thing on my list of things to do with the bike is to get it running. Once that has been accomplished, I can start to work on the other details, but I want to hear it run first. So after charging the battery (which the previous owner said was new this year) I reinstalled it and turned the key to the on position checked to make sure the transmission was in neutral held in the clutch and hit the starter. Nothing happened, no clicking, no attempt at all by the starter to turn the engine over. The headlight, which was shining brightly, did not dim when I hit the starter either. So on to the next attempt, the kick starter, after a couple of kicks nothing came to life so that was disappointing but not surprising. I did buy a bike that the previous owner did say didn’t run, but sometimes you can’t help but hope that it is something very simple. My first suspect is the starter, because it didn’t work so my first order of operations is to bench test the starter, once I do that I can see if it is functioning or not. My hope is that the starter is bad mainly because I can rebuild that for pretty cheap, and then I don’t have to worry about tracking down any sort of wiring issues. So the first thing that I did was take out the starter, my plan being that I would take it to an auto parts place and have them test it out. So I took the starter out which went off without a hitch except for having to remove the cam chain tensioner in order to get the clearance to remove the starter. When I read in my Clymer that I would have to do this I was worried that it would be a hassle (like my SV650s were) but it was a simple mechanical process with no springs only a adjuster screw and a lock nut, soooo nice! What I didn’t realize with my only experience being with automotive starters is that the solenoid is not attached to the starter; rather, it is on the frame of the bike. So as soon as I get time I will re-install the starter and then I can jumper the batter directly to the solenoid and see if the starter engages that way which would narrow the problem down to the solenoid or the starter before the starter shows no life. If it kicks over then I have to find the fault in the wiring. I did do a cursory check of the wires running to and from the starter switch and the clutch safety switch into the wiring harness and they appeared to be fine. The second suspect is the carburetors mainly because it’s a 31 year old bike and there has got to be some varnishing going on in there. You would think that if the ignition system is working and the bike was getting fuel I would be able to kick start it, but there was no life. I have already torn into one of the carbs which I would have done either way to be thorough (my next posting will be on the carbs) I am hoping to find some clogged pilot jets that would be keeping the engine from being able to idle. 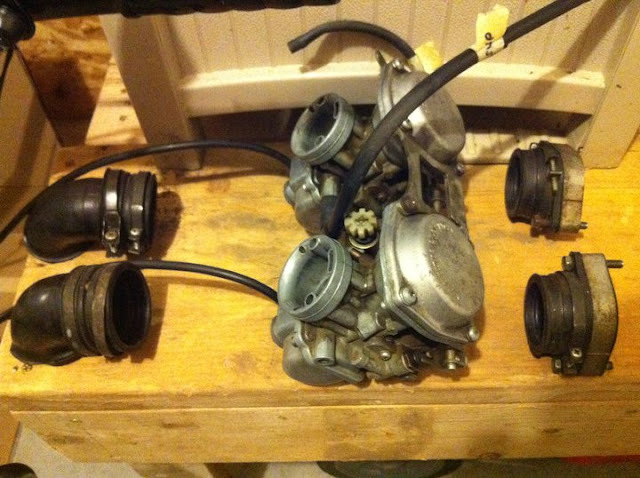 If there are no carb issues, then I am going to have to look into the ignition system such as the points and condenser (which I know nothing about) as well as the plugs and the spark plug wires. Hopefully my first two suspects are the one or both of them that are the guilty party and I will have a running bike shortly so the fun stuff can start!